Today, 34 children will be diagnosed with cancer. You can help one of our Rush University Medical Center pediatric patients by donating blood or platelets here at the Rush Blood Center. An elementary school-age boy who arrived in Rush’s emergency department with a fever, bruising and fatigue, who was diagnosed with leukemia and immediately began chemotherapy. During the first month of treatment, he received blood components 18 times. A toddler who received blood and platelets a combined 74 times during the course of her nine-month battle with advanced neuroblastoma. She’s now cancer-free and thriving. 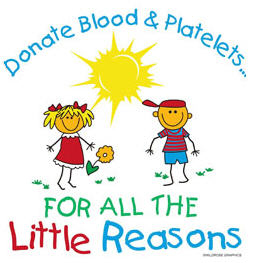 A blood transfusion or platelet transfusion, when necessary, can dramatically affect a child’s quality of life and ability to continue on schedule with life-saving treatments such as chemotherapy, radiation and surgery. You can help save a child’s life. Please donate today … for all the little reasons, and get your own Little Reasons t-shirt. For more information, please contact me at blood_donor@rush.edu or (312) 942-7824. Malissa Lichtenwalter is an Apheresis blood donor recruiter with the Rush Blood Center. This entry was posted in Cancer, Children and tagged blood donation, platelet donation, rush blood center, Rush University Medical Center. Bookmark the permalink.